Last week our guest blogger, Lisa, gave us some great tips for utilizing furniture and spaces in multiple functions. We love the idea of minimizing the amount of ‘stuff’ in our lives, so this week we’re going to highlight some of our favorite products that have multiple uses. Dirty Jobs Complete Cleaner: Although many people think cleaning and organizing are similar t asks, here at WOW we dislike cleaning just as much as the next person. 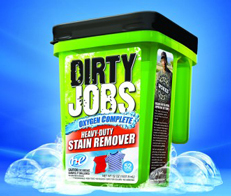 That’s why we loved sampling the new Dirty Jobs Complete Cleaner. The product, available at Walmart, was inspired by the Discovery Channel show and really works wonders. The best part is that unlike single-specialty cleaners, this works just about anywhere. Use it in the laundry, the bathroom, on upholstery, or the carpets; it will get the job done. Food Processor: We love kitchen appliances, but sometimes they can be space hogs. Food processors, however, combine the functions of blender, chopper, cutting board, specialty knives, mortar, cheese grater, and more. If you are low on storage space in your kitchen, consider switching to this multifunction appliance as your go-to tool. Ice Cube Tray: This everyday item, that many people no longer use, due to integrated ice makers are great for organized storage. Use them for earrings and rings, small junk drawer items, cuff links, hair accessories, sewing materials, crafting supplies, etc. Dryer Sheets: Instead of tossing out your used dryer sheets, use them to freshen up other areas of the home. Rub them on the inside of smelly shoes to reduce odor, place them in the bottom of your underwear drawer or under your car seat for added freshness, or run them along a couch to pick up animal hair. The new ones will work best, but even the old ones can be put to good use. Toothpaste: It can be a bit odd to consider using something you put in your mouth each day for other purposes, but toothpaste has a variety of household functions. It can fill in small holes in your walls, soothe bug bites, polish chrome and silver, remove crayon coloring from walls, and reduce blemishes, among other things. These are just a few interesting multi-purpose products. What are your favorite tricks for making the most out of your belongings?